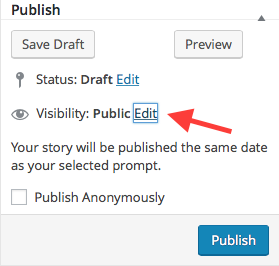 When you write or edit a story, you can decide how to share it using the Publish box in the upper right corner. 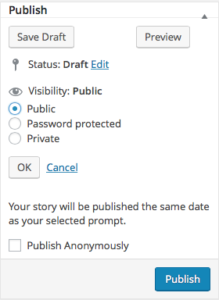 The Visibility control lets you share stories with the entire community (Public, the default), but by clicking Edit, you can also choose to password protect it (and give the password—for now—to to those other beta testers you select) or keep it private. You can also click Publish Anonymously to remove your byline from the story.